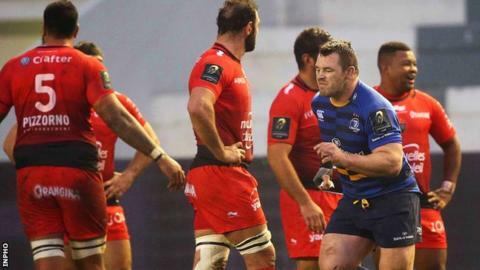 Leinster prop Cian Healy has been given a two-week suspension for a "reckless act of foul play" during their Champions Cup defeat in Toulon. Healy, 28, was cited for striking Guilhem Guirado with his knee during the 24-9 loss, but pleaded not guilty. At an independent disciplinary hearing, judicial officer Jeremy Summers deemed the offence to be worthy of a ban at the lower end of the spectrum. A three-week ban was reduced by a week for good behaviour and good conduct. Ireland forward Healy will miss the Pro12 clash with the Ospreys on 8 January and will next be available to play for Leinster in the Champions Cup game against Bath on 16 January. He was not named in the match-day squad for Friday's derby against Connacht at the RDS. Both European Professional Club Rugby (EPCR) and Healy have the right to appeal against the decision. Healy initially faced a striking charge which was found to be not proven, but the incident was deemed to be foul play and he was banned for two weeks. He won his appeal against that suspension, but an independent committee decided the citing complaint should be reheard. Leinster had argued that Healy was cited for one offence yet suspended for another. The front row was cleared by EPCR to play in the return fixture on 19 December, which Toulon won 20-16. Welsh judicial officer Roger Morris amended the charge to "dangerous charging or obstructing or grabbing of an opponent without the ball, including shouldering", in breach of World Rugby's regulations. The decision that the complaint should be reheard by a different judicial officer was made by an independent appeal committee on 23 December.